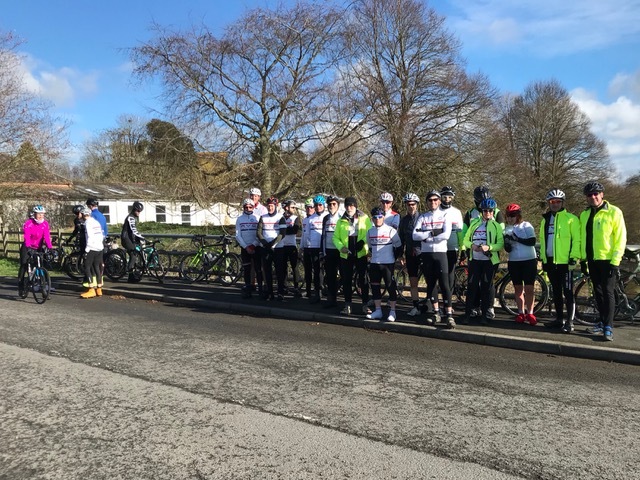 Rye and District Wheelers’ first event of the year, the Captain’s ride, took place on Sunday March 17 with a hilly outward route from Appledore via Aldington and Lympne to Hythe and back across a windy marsh. The Captain’s ride is about 35 miles but many members ride from their homes – Rye, Ashford and some exceed 70 miles. It’s a fun event which takes place 3 times a year and brings the club together as there are numerous club rides and abilities. Various routes can be taken to Hythe, some, usually the slower riders, take the Marsh route through Ivychurch passing St.Marys, slightly faster riders take the Aldington route and the fast guys take a more arduous detour with extra miles. Everyone meets up for breakfast at the Railway Cafe in Hythe and then the whole club cycle back across Romney Marsh, this time against a strong south westerly. A total of 26 riders took part with mixed abilities but no one was left behind!